Over the span of nearly three hours today, Senators from both parties grilled former FBI Director James Comey about his relationship with President Trump, the circumstances of his firing, and various aspects of the federal probe into Russia's 2016 election meddling. For the most part, the hearing was conducted professionally, with important lines of questioning emerging from each side of the aisle. 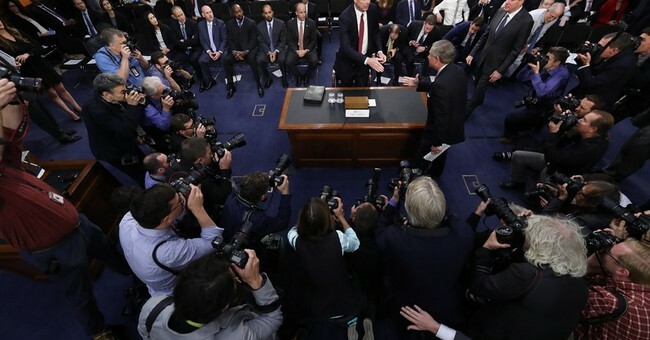 As we anticipated earlier, a number of aspects of Comey's testimony were profoundly unflattering to President Trump, including Comey's multiple assertions that he does not believe Trump to be a truthful and trustworthy person. Other sworn statements undercut anti-Trump narratives, especially the notion that the president sought to stymie or shut down the Russia investigation, which goes to the crux of the cries for impeachment. Here are the moments and revelations that stuck out to me, in both directions. (2) Comey clearly and repeatedly stated that he viewed the wishful request, or statement of hope (not necessarily "pressure" or an "order"), from the President of the United States as a directive. Given the power relationships involved, this is a completely reasonable conclusion to reach, particularly considering Comey's eventual fate. Comey flatly accused the White House of lying on several occasions, and directly stated that Trump's televised claim that Comey, not he, had initiated their now-famous private dinner was untrue. On this point, the former director seemed entirely credible. Why does that matter? Because if people are inclined to believe Comey in such a seemingly-minor dispute, it demonstrates that Trump's willingness to serve up cavalier, self-serving lies, even on relatively small details. (5) Responding to a query about Trump's cryptic tweet about secret audio recordings of his conversations with Comey, the former director said he would waive any claim of privilege or privacy if such tapes exist and can be produced. The White House press team continues to claim ignorance on the existence of the tapes, and Comey's reference to them -- and apparent eagerness for them to come out -- will ratchet up pressure on this subject. Regardless of whether the recordings are real or were an empty threat, Trump shot himself in the foot with that tweet. Impulsiveness and immaturity have consequences. (1) Comey asserted that Trump was never the subject of any FBI investigation, and confirmed Trump's claim that he shared this information with Trump on at least three occasions. (3) Under questioning from Senators Cornyn and Cotton, Comey averred FBI agents have a duty to report crimes of which they are aware (subtext: including obstruction of justice, which Comey never alleged or reported), and that he never considered writing a letter of resignation as a form of protest of perceived instances of obvious wrongdoing or impropriety (context: as he had done in a previous administration). Aside from writing the later-produced memo and eventually requesting that he not be put in any additional one-on-one settings with the president, Comey did not contemporaneously respond to Trump's inappropriate and 'stunning' requests with a level of seriousness or severity commensurate with criminal wrongdoing. (In fairness, Comey's unexpected dismissal could have shifted the calculus). (5) Comey affirmed that a number of press reports about the Russia imbroglio, based on leaks and unnamed sources, were "dead wrong" on substance. He knocked down one particular New York Times item, which was the subject of much hyperventilation, as factually false -- and his testimony about informing the president that he wasn't an FBI target blew up a big CNN "scoop." (4) Some news outlets made a big deal out of this reply, but it's critical to note that shortly thereafter, Comey clarified that by punting on the question (partially because he's no longer in government) is was not implying anything 'nefarious.' There is still zero evidence that Team Trump colluded with the Russians. (5) Much has been made of the president's decision to clear the room prior to requesting that Comey 'let go' of the Flynn stuff. Comey himself said that he was very concerned by it, and that the action raised red flags that something highly improper was happening -- and, importantly, that the president was cognizant of that sketchiness. I agree with Sen. Collins that demanding other potential witnesses leave them alone, as well as the "expression of hope" itself, were both highly improper. However, could this be a piece of context that might help explain why Trump may have been led to believe that holding private, one-on-one conversations on this subject with Comey wasn't inappropriate?